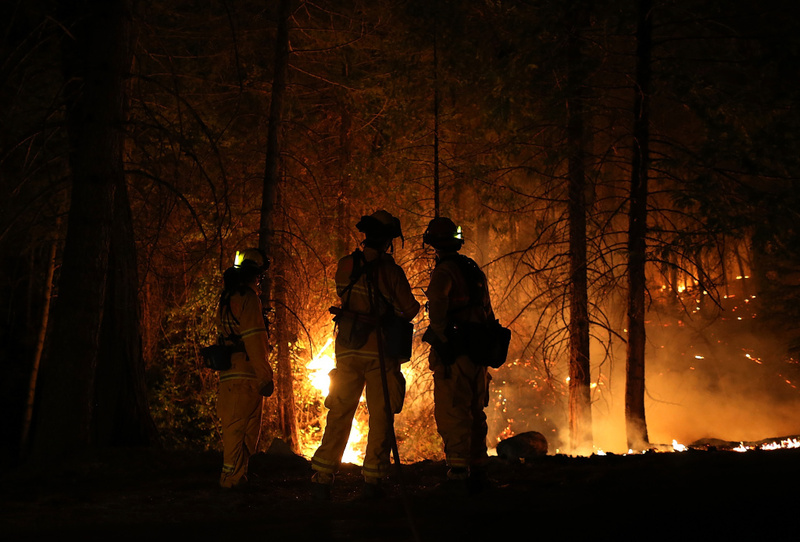 Firefighters from Cosumnes Fire Department monitor a back fire while battling the Rim Fire on August 22, 2013 in Groveland, California. Firefighters battling the giant Rim Fire burning in the Sierra Nevada and into Yosemite National Park have added a California National Guard Predator drone to their arsenal, Kelly Huston, deputy director of the Governor's Office of Emergency Services, tells KPCC. The National Park Service posted this timelapse video of the fire. The 12-day-old Rim Fire continues to grow, expanding to over 300 square miles, or 192,466 acres. Containment rose Wednesday to 30 percent. Increasingly confident fire officials said they expect to fully surround it in three weeks, the Associated Press reports, although they say it could burn until the dry season ends this fall. "This is the latest technology used by the military, and is now being applied for this fire," Huston said. He said that it lets firefighters see real-time video and infrared information and send that straight to incident commanders to help them make decisions. "[It's] providing realtime data to those incident commanders, who are literally in the middle of the forest and the middle of where this fire's burning, making decisions about the deployment of thousands of firefighters and all kinds of resources," Huston said. The plane will remain over the burn zone for up to 22 hours at a time. It can fly low, but generally stays between 10,000 and 15,000 feet, Huston said. "That altitude allows for the best view for the imaging sensors that are on there, and plus it also keeps it out of the way of the actual aircraft that are flying the parts of the fire trying to put retardant down," Huston said. The infrared data tells firefighters, as Huston put it, "what's on fire and what's not on fire, so they're not sending firefighters in areas where there's a lot of smoke but it's really not burning." What does the rest of this year's fire season hold? Huston said he hopes the Rim Fire isn't an indication of this year's fire season, but that if there are more wildfires and the Santa Ana winds pick up, there could be another large fire like the Station Fire. He said that the drone would be a big help in that situation. "When before it was done on an experimental basis and flown in other fires, but now it's a part of the apparatus, just like a firetruck or a helicopter, it's something that those incident commanders can call into the scene," Huston said. Correction: An earlier version of this post misidentified the park in which the Rim Fire has been burning. We regret the error and thank our Twitter followers for the correction.